Whether it's for a quick game of basketball in the kid's bedroom or to hang above your trash can at the office, this personalized gift idea is a slam dunk! 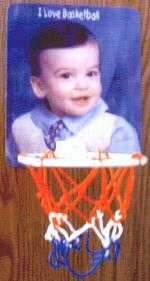 7"x9" backboard with a 6" plastic hoop; secures with Velcro tabs. Backboard can be made vertical or horizontal.